When you damage your tablecloth… make cushions! We were very generously given a beautiful linen tablecloth for our wedding and I loved it! Unfortunately however, some freshly squeezed orange juice made it’s way on to our beloved cloth, then reacted with our washing powder only to leave behind some very large and unattractive bleach patches. I couldn’t bring myself to throwing it out, so I have given it (well, the best parts) new life and used the good material to make cushions! For the backing I used some linen coloured cotton that I had left over from a quilt I had made, and for the piping fabric I used a $5 remnant of white cotton, so these cushions really didn’t cost me much at all! It was my first attempt at making piping.. extremely frustrating but very rewarding! I found this youtube video very helpful, but I did find myself repeating his phrase “Just let the piping glide on through” in a very sarcastic tone many times – he made it look so easy. I’m really pleased with the result, they are a nice finishing touch to our spare bed and I can appreciate my cloth once again. Clearly far too lovely to waste. Your wedding gift lives on… hoorah! I absolutely love the texture of linen. 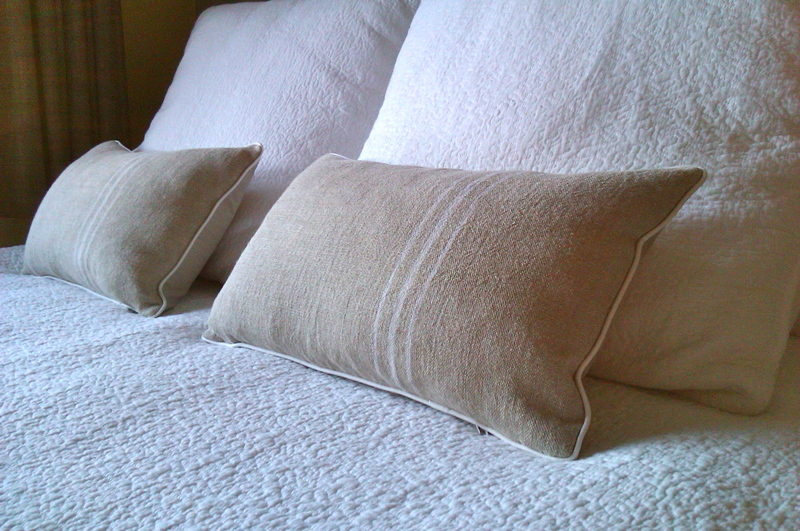 And I love the simplicity of these cushions too.